Hope you still remembered our recent entry about the NICI Cushion Apple. This green apple with worm is from the Jolly Lucy series. 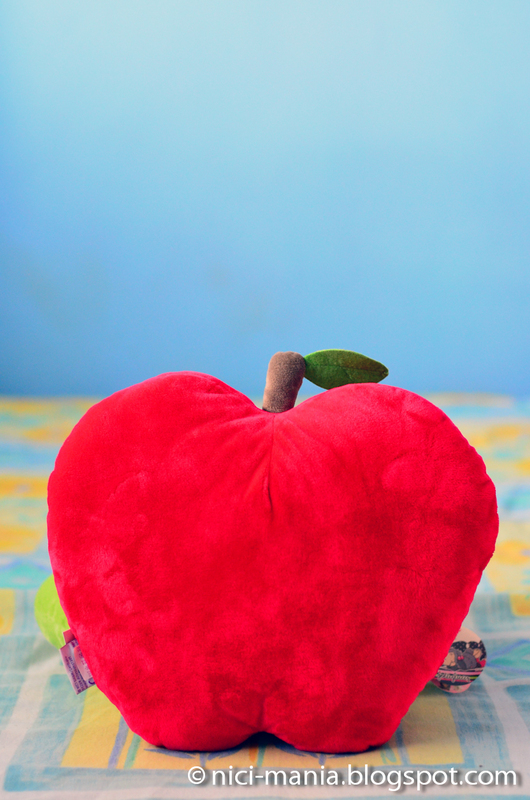 The thing about our NICI apple entry was this red apple cushion. This red apple was not mentioned anywhere on the official NICI website. Hence we were curious whether it was an imitation because it bears a real NICI tag. 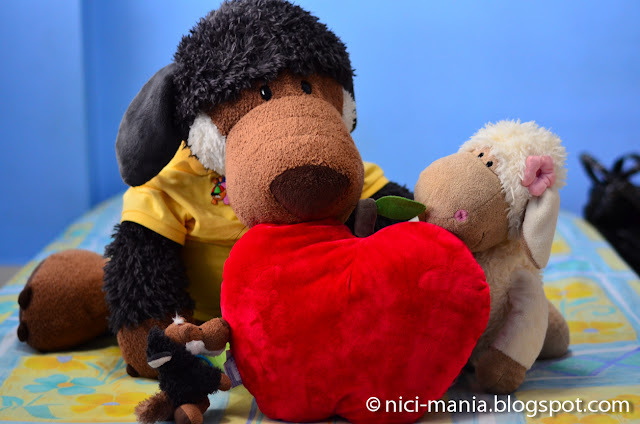 This sparked the interest of NICI Germany as well, one of the very nice personal spoke with us and we sent some pictures of the red apple to them. 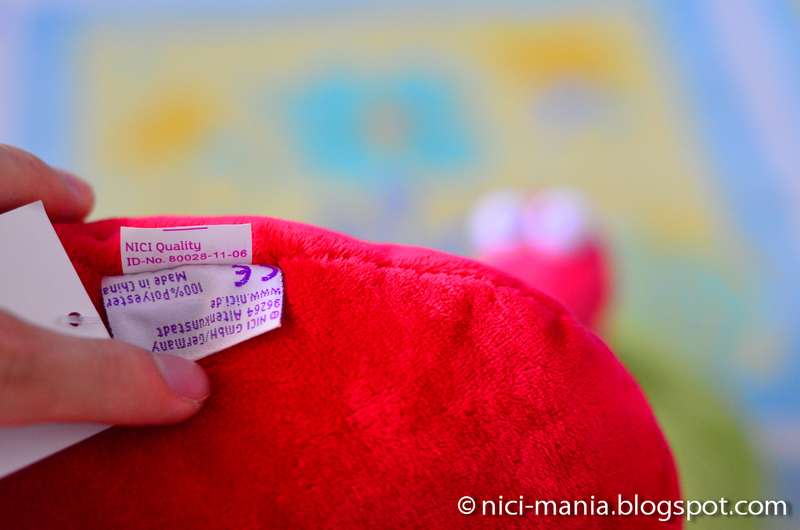 The red apple has the NICI Quality tag. 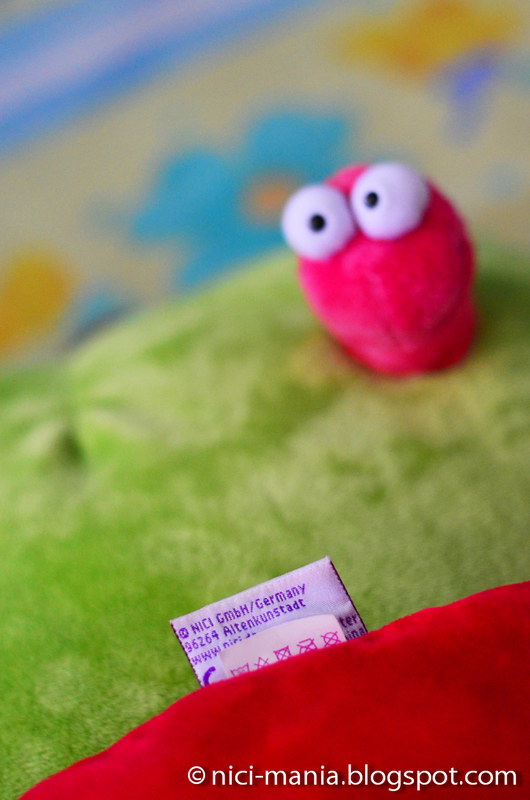 Green apple worm stares at the red apple! 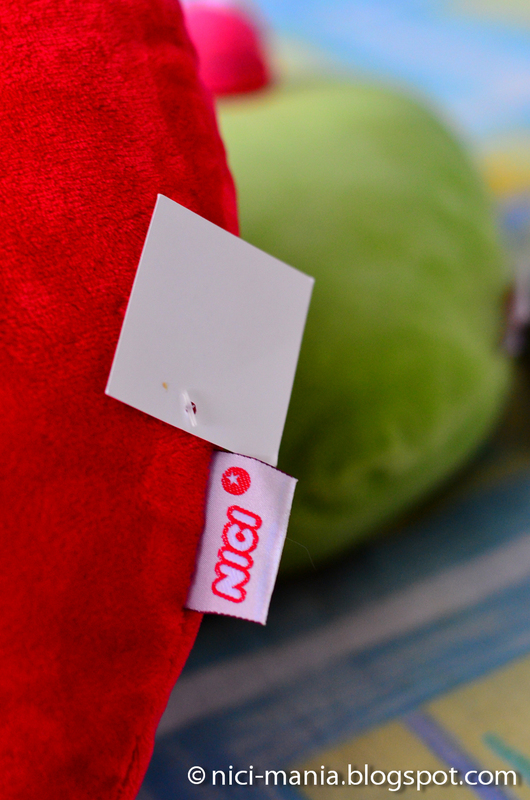 NICI Germany has replied and here is what they said..
We have checked the pictures and the product and can announce to you that this red cushion is an official NICI product. It was made by NICI Asia in a small edition about 600 pieces. Thank you for the picture and your great support!! We in Germany do not have the overview about all the products our partners sometimes produce. Particularly those special editions. So there you go. It is confirmed that not only the red apple is a genuine article, it is also a limited edition! 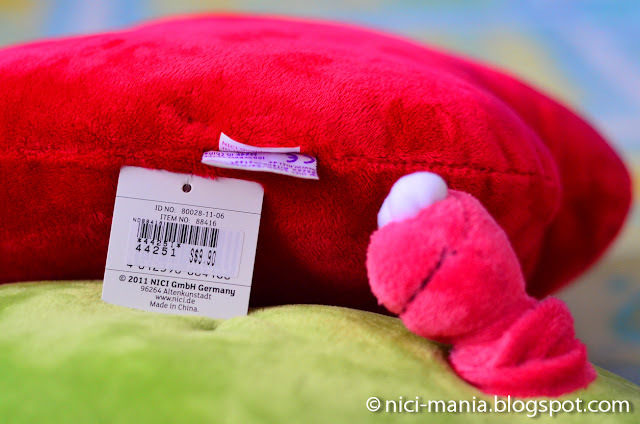 Now that we know the red apple is a limited edition NICI product. Everyone wants to take a bite of it!! What a nice picture, the one of the staring contest, haha. Very nice of Nici Germany of replying to your email. It seems now you are the lucky owner of a collector's item, since this cushion is probably not sold worldwide. Enjoy!! Hoh... I see. 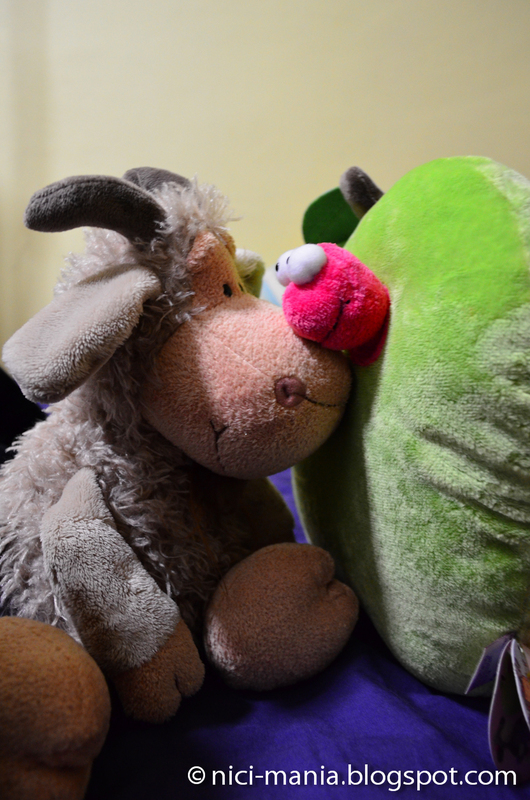 Cos last time I saw the red apple when Nici-wildfriends bought a monkey, elephant, and green apple. so I tought you bought it from Brian... lolz... anyway where you got it from? I have adopted a new hobby, which is collecting sheep from Nici. Your pictures are hilarious and I can't help reading your blog to the end. I especially love this piece and can't help sharing it on my facebook. I hope you don't mind. Should you have any objections, do leave a comment and I will delete the post at once. Thank you.